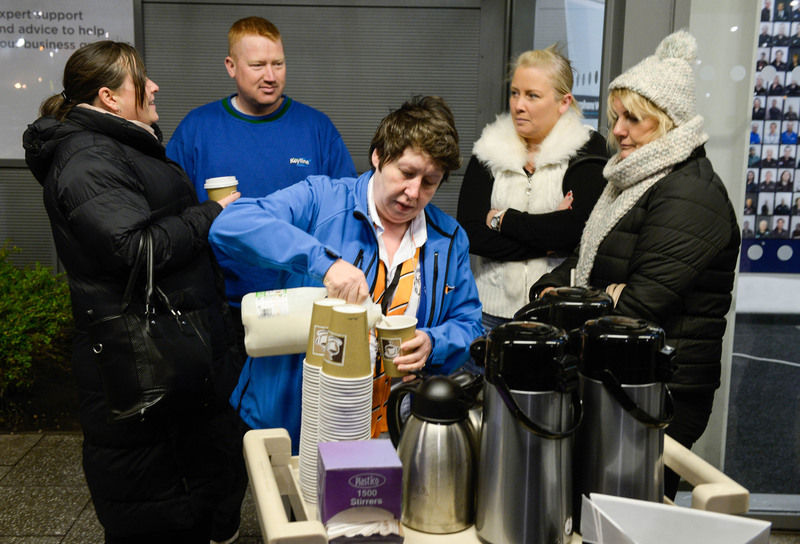 KIND-HEARTED bosses at the intu Braehead shopping mall yesterday gave out free cups of tea and coffee to shoppers who had been queuing outside to bag a Black Friday bargain. Staff from the mall were on hand at 5.30am as intu Braehead tea lady for the day, Sadie Matts poured warming cuppas and a teacake for those who’d been waiting in the queue for Curry’s PC World to open at 6am. Linwood man Eddie Mason, 55, made sure he was first in the queue by turning up before 5am. The heating engineer came out to take advantage of the big discounts on offer before heading off to his work as a heating engineer. He said: “I’ve been looking to buy a television for a wee while, but I thought I would wait until Black Friday to get the best deal. Throughout yesterday, tens of thousands of shoppers turned out at stores at intu Braehead where discounts of up to 50 per cent were on offer. Marketing manager for intu Braehead, Christine Macdonald said: “We always like to look after our shoppers, so we thought we would go the extra mile for the hardy souls who had been queuing outside our Currys PC World store. Christine added: “The shopping centre opened earlier than normal at 8am and there were some fantastic bargains to be had right across the range of shops we have. Extra teachers now in place in Renfrewshire to close the attainment gap Paisley Pirates Christmas Offer for Local Groups!